dynamically, in which you send the 3DSecure parameter in the payment request. 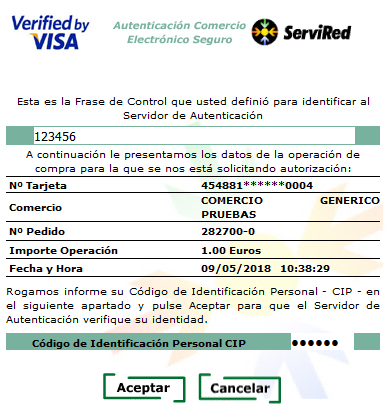 Access the RedirectURL received in the payment response and enter an identification code. Please note that the landing page will be different depending on the card issuer. For test purposes, please enter the identification test code received on the page (123456). For a Success 3D Secure Authentication click on the Acceptar button and for a Failed 3D Secure Authentication click on the Cancelar button. You will receive a payment notification to the Notification URL you setup in the Merchant Dashboard containing the new payment status. For more information on Payment Notifications with Success or Failed 3D Secure Authentication, go to our section 3D Secure Payment Notification.